You know, it’s no accident that guitar music happened so much in Spain. It evolved from the Lutes/Ouds that were brought by the Moors into the south of Spain. And they didn’t just bring the instruments, they brought culture and ideas and an Arabic sort of soul. So now that you’ve heard Sabicas, take another listen to Munir Bashir and see if you can hear how flamenco evolved from Arabic music. Interestingly Munir & Sabicas occupy very similar positions in their respective musics: masters of tradition and inimitable innovators who have influenced literally everyone to come since them. Really, if you can just ignore the differences in scales, the musics are very similar. Like, listen to the flamenco handclaps and then listen to the percussion behind Munir’s oud. Or the way they’ll play a flurry of notes and then just stop dead, leaving their musical cloud to dangle on the brink. And this points to the mystery – the hole! – which is at the heart of these musics, and let me tell you – it sure as hell didn’t come out of any European church / court music. It came from people who can never name God, so who must constantly make reference to his unfathomable presence through the patterns of emptiness and splendor that is this mosaic of sound. The form taken in Iraq by the sawt of hidjaz is the maqam which is the most perfect and noblest form the scholarly music of that country can offer. The maqam is performed by one singer (the qari) and three musicians who play respectively the santur – a cithara derived from the Greek psaltery, the djoza – a vielle resting on a pike and the tabla or dûnbak – a double drum. To constitute the djalghi baghdadi of nawbah another kind of drum is added: a riq – the drumhead of which is stretched on a wooden frame, – The principal part characteristic of the maqam is a poem written in one of the sixteen varieties of classical metres either in literary Arabic or in spoken language. In the latter case the poem is called zûhairi. The maqam, the tradition of which has lasted in Iraq for nearly four centuries, has been transmitted orally by the Iraqi masters in an uninterrupted chain between past and present. The singer improvises melodic passages making freely use of different rhythms while passing progressively from one part of the chosen mode to another. Displaying all his virtuosity and flexibility of voice he reaches the acme of the maqam; then leaves it imperceptibly and comes to the final note of the mode after having embroidered musical phrases, all of them proofs of his talent and spirit of invention. The maqam starts with the tahrir often preceded by an instrumental introduction called badûa and composed on a well-defined rhythm; the singer accompanies the badûa passing alternately from high-pitched notes to low-pitched ones. The tahrir is made of one or more songs, the texts of which may be extended by one or two Arabic, Persian or Turkish interjections added by the singer when the texts of the songs prove too short with regard to the improvised melody. The maqam ends with the taslim or taslom which is a text set to a falling melodic passage ending with the final note of the scale of that maqam. Between the tahrir and the taslim there is a series of melodic passages of variable length which are performed alternately by the singer and the musicians and which develop in turn the different parts of the scale. The artists who interpret the maqam-s are considered to be authorities on the matter of repertory; they know all about it and are famous for the specific way everyone renders such a maqam. Some of them are famous for the passages they have added to certain maqam-s, others for the composing of whole maqam-s with a view of enriching the already rich repertory. A concert made up of maqam-s only is called a fasl. In such a fasl the maqam-s are always played in the same order and the fasl is named after the first maqam of the series. The Iraqi repertory offers five fasl-s: bayati – hidjaz – rast – naûa and hûsseïni. At the end of every maqam the orchestra plays a pesté which is a piece of music composed in the same mode as the maqam. This device allows the singer to rest before the beginning of the next maqam. In former times it was usual to play several fasl-s in a musical evening. Among the masters of the maqam who have carried on its musical tradition, generation after generation, and whose names are still known nowadays, we will mention: Mûlla Hassan Babûdidji (1782-1840) and his pupil Rahmallah Shiltag who taught a whole generation of artists, the most famous of whom were Ahmed Zaidan and Mûlla Osman Almûssili. Many artists of the following generation have Ahmed Zaidan to thank for their musical talent and their fame, for instance Rachid Kandardji (deceased in 1963) and Abbas Chaikhali. Among the artists of the next generation we will quote the great master Mohamed Elkabbandji who was born in 1901 and considered as the greatest of his time for the register of his voice as well as for the precision of his interpretation of the traditional maqam. Endowed with a very good memory, he had memorized a great number of poems, which allowed him to sing what was fit in all circumstances. He was the one who was sent to Cairo in 1932 as an Iraqi representative to the Congress of Arab Music. Is the text of the maqam secular, it belongs to the classical repertory but if the text is religious the maqam belongs to the Sufi music which has also its famous performers among whom are Elhadj Jalal Elhafnaûi and Charif Mohieddine Haidar. The latter was the dean of the Baghdad Art Academy and taught a great number of lutanists his method. Among these we will quote: the names of Jamil Bachir (deceased in 1977) and his brother Munir Bachir presently secretary-general of the Arabic Academy of Music. 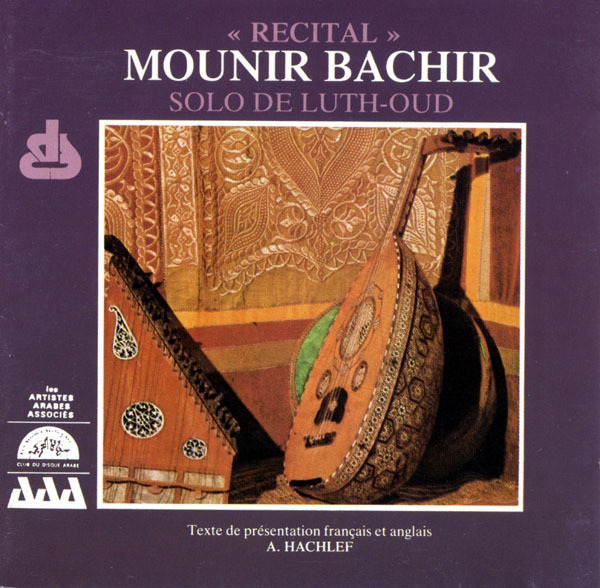 Simon Jargy, a professor at the University of Geneva, considers Munir Bachir as one of the greatest soloists of ud and one of the greatest musicians of the Arab world. Born in the northern Iraq, Munir Bachir belongs to a family of very gifted musicians who have passed on from father to son the noble art of playing the lute. “He was but five years old, S. Jargy writes, when (together with his brother who also became a well-known lutanist) he was taught the first rudiments of lute playing by his father who had become impregnated with the purest oriental and Arab musical traditions of Baghdad, the old capital of the Abbassid Caliphs. Knowing all the subtleties of Arab music and mastering all the secrets of ud playing, Munir Bachir has rapidly become a great artist and an unrivalled virtuoso, giving back to this instrument the importance it had at the time of the Thousand and One Nights. After World War II, he founded an academy of music in Baghdad with a view of teaching ud playing to talented young people. Then he was appointed as a professor at the Art Academy where he succeeded his master Mohieddine Haïdar. He became also head of the musical programme for the Iraqi broadcasting Co. Wanting to widen his knowledge, Munir Bachir went to Budapest where he studied traditional folk song and music. In 1965 he obtained a doctor’s degree in Budapest and was appointed there as an assistant lecturer at the Academy of Science in the department of folk art. At the same time he gave a series of recitals in Hungary patronized by the famous composer Zoltan Kodaly who was one of his admirers and who encouraged him to acquaint people with the authentic Arabic music. Subsequently he gave concerts in the Near and Far Eastern countries”. Touring Europe he first came to Geneva where this concert was recorded, parts of which are presented here. To complete the timing of this compact disc we have resorted to the most prestigious lutanist of the thirties, Mohammed Elkassabgi, who was also one of the first composers of the great singer Um Kalsum. Mohammed Elkassabgi’s improvisations: a taksim bayati, a taksim saba, a taksim hidjaz kar and a rhythmic piece, dalaa elhawanem (Ladies’ coquetry) have been chosen to let music lovers compare the individual skills of each of these two talented artists separated by more than a quarter of a century. It will also enable us to stress on the one hand the mastery and the inventiveness of the classical school which Mohammed Elkassabgi belongs to, and on the other hand the virtuosity of the younger generation of artists, one of whom is Munir Bachir. 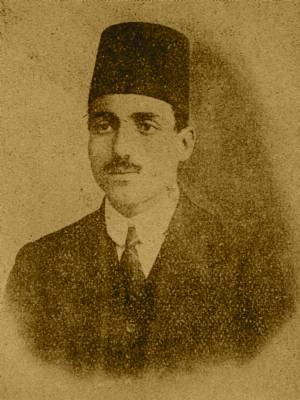 Mohamed el-Qasabgi (محمد القصبجي; pronounced [in the Egyptian dialect] el-Asabgi) (1892 – March, 1966) as an Egyptian musician and composer, and is regarded as one of the five leading composers of Egypt in the 20th century. Most of his credits went to Umm Kulthum, Asmahan, and Layla Murad who sang most of his great works and scores. 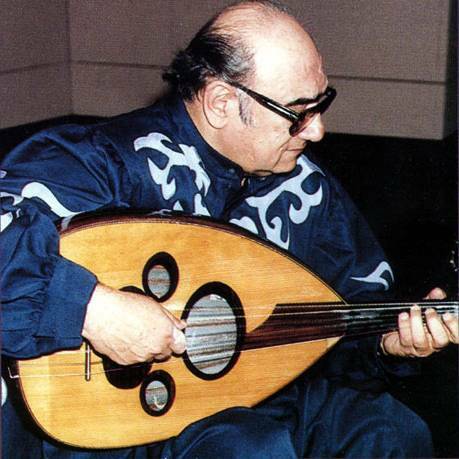 Until today, most critics classify Mohamed El Qasabgi as the master of the oud due to his great abilities and skills which he had during his time. In most of his tunes, there is a real sensation of the pure Oriental spirit, mixed with European musical techniques and taste. This was mostly seen in songs like Ya Toyour, Raa’ El Habeeb, Ana Albi Daleeli. In the above mentioned songs and many others, he was widely recognized by most musicians and critics at that time as the leader of development of Oriental music and mixing it with newest musical techniques, such as influenced brought in from Western classical traditions of his time. thanks to the unbeatable Lemmy Caution! This one builds to a pretty amazing percussive climax in the second half of track 1. Also, you get to hear very Sandy Bull-ish oud-delay, which for some reason is less cheesey than most kinds of delay/echo effects. This entry was posted in oud, seeds, world. Bookmark the permalink. Many thanks, irate one. 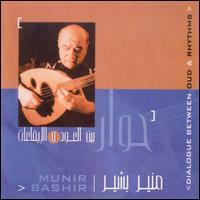 Munir Bashir was the master of al-oud. Your posts show exqusite taste in music.